Japan's best UN and Journalism Simulation! 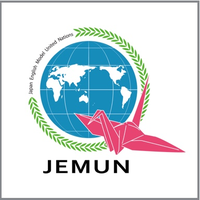 The theme of the 2018 JEMUN Conference will focus on SDG 2- ZERO HUNGER and SDG 3- GOOD HEALTH AND WELL-BEING. Zero Hunger and Health go hand in hand as a hungry world will never become a healthy world. Join over 300 JEMUN participants and support the HEALTHY NOT HUNGRY Campaign at JEMUN 2018.